I just received this email from Sam, a Same Hat reader. 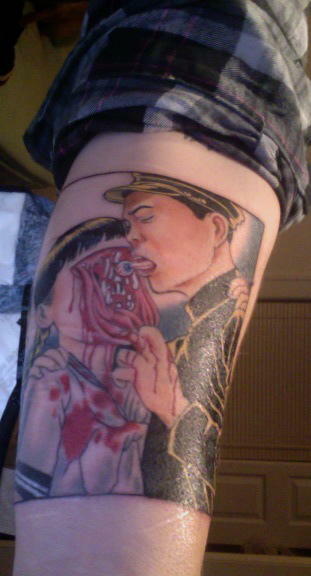 This weekend he spent 6 hours getting a gory Suehiro Maruo tattoo on his arm. Sam's tattoo was created by James the Human Furnace at 252 Tattoo Columbia Station in Ohio. Thanks for sharing it with the community! You can also check out the growing collection of other tattoos featuring horror & indie manga. Gorgeous! I love the design and coloration of it; very calm and cool (and by extension very ironic). The simple box border works well in this instance. Along with the Kago tattoo, this has got to my favorite of the ink Sam Hat has featured so far. I bet the ladies just love a man with a misogynistic tattoo on their arm. Whats so misogynistic about about ripping apart the world of superficial appearances and making contact with the soul of the universe embodied in biological life, hu? Funny, I'm as feminist as anyone but I never saw this (or any of Suehiro Maruo's similar images) as misogynistic. I think Mr. Vioxx Fact gets what's going on in this image, more or less: the subversion of surface appearances to facilitate true intimate contact - and I'd add the subversion of conventional Japanese images of innocence, uniformity and childhood. Thanks for the comments, and well said Mr.Vioxx and Anja. :) I do feel it shows that its whats under the skin that matters and the struggle to to get there. You really have to have some loose wiring in your head to get an ugly, horrible tattoo such as this on your body. Guy needs a shrink. So do the artsy fartsy people who give this tragedy a thumbs up. Wonderful I bet this is done by a great tattoo artist. It is the not the work done by a normal tattoo artist. I like this colorful appearance of tattoo. I think this superficial tattoo has a very deep meaning.